In 2012 my mum was diagnosed for the third time with breast cancer and began her gruelling course of chemotherapy and radiotherapy. Her grit and determination inspired me to pull a group of friends together to undertake a challenge that was to cycle "Coast to Coast" from Whitehaven on the West to Tynemouth on the East in May 2013. Within days of the initial discussion the group had swelled to 11 riders, many of whom hadn't ridden a bike since school days. The trip was a fantastic experience and we raised £6,795 for Macmillan Cancer Support in the process. This year we met again to discuss a similar challenge and the idea of cycling from Newcastle to Edinburgh was born. Although we had fewer team members taking part this year - Bill (Justin) Smith, Kevin Parnham, Rich Foster and myself (Rich S) - we were still determined to raise as much money as we could for our selected worthy cause. 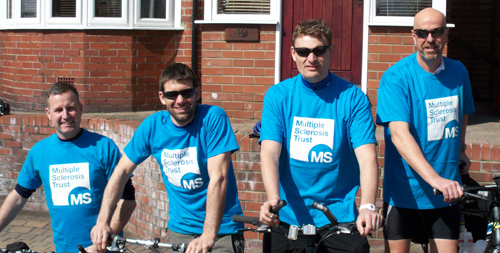 Justin Smith's father was diagnosed with MS 25 years ago and has long suffered at the hands of this terrible illness, and through talking to Justin we agreed that the MS Trust would be a fitting charity to undertake this ride for. We set off from Grimsby mid-morning and headed north to the start point. By just after 2pm we were on our way across the Tyne and ready to start from the central station. From here we headed south onto the Quayside, then east to Tynemouth. Once there we turned north and with a gentle back wind, headed towards Scotland. As we approached Amble, our end point for the first half day, I encountered the team's first puncture with 3 miles to go. In spite of this, the day ended ok and we'd completed 50 miles and climbed around 1400 feet. After an early start and full English breakfast, we headed out into the picturesque Northumberland countryside. We passed through Warkworth, Alnmouth, Boulmer and Craster amongst others, before stopping for the most expensive chip butty in history at Seahouses. Feeling slightly sore now (and lighter in the pocket) we headed on until 3 miles before Berwick on Tweed where I got another puncture - same tyre and same distance from the end point of the day! The day finished with 60 miles completed and 1755 feet climbed. Arising from a very poor night's sleep in a dorm at the Youth Hostel, we set off into the horrendous head wind. As we turned to head west we realised this wind was going to be with us for the day. Loosely following the A1 along the coast we all found the going extremely tough. Having climbed a 750ft peak we then realised there was to be no benefit on the other side: we had to pedal just as hard on the way down as the wind gusts were now around the 40 mph mark! By lunch time all of the group were exhausted, sore and quite fed up with the poor progress we were making due to the wind. It was Bill (Justin) that gave us our turning point; he gave a rousing speech about why we were doing the challenge and that the pain we are feeling right now will soon fade, for his father the effort just to cross the room or turn the TV on is something he has to encounter every single day due to MS. That turning point spurred us on, and whilst the weather continued to batter us we somehow managed to enter Edinburgh approximately 10 hours after we had started riding that morning. However there was one final, now predictable occurrence still to come… Yes, I got my third consecutive puncture again 3 miles from the finish line! 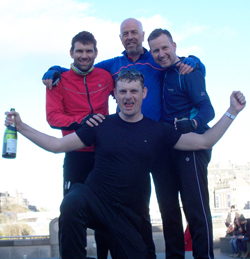 We finished at the end of the Royal Mile and were met by Kevin's partner (Jo) with a smiling face and a bottle of bubbly! The pains have now started to ease and talk has turned to "the next episode" - I'm not sure if I am ready for that just yet but I'm pleased to have been part of a great team that has so far helped to raise nearly £1500 for the MS Trust. I'm off now, to buy some new inner tubes.